The KOOLTRONIC KoolTray II delivers cooling air to hot spots by localizing fan placement to the heat generating area(s). 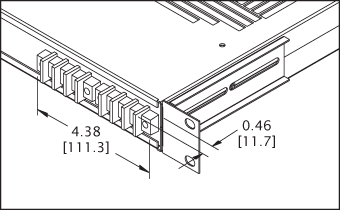 With its 1¾-inch [44.5mm] single-U height it fits right under card racks or near heat-producing sources. Standard units are available in 1, 2, or 3 row models. 19-inch [482.6mm] unit width is standard. In addition to specific cooling fan placement, the Smart KoolTray II provides two optional choices of component protection. The X5 option sends both a visual and external alarm in the event of fan failure or low fan speed. The X7 option varies the fan speed as temperature decreases or increases relative to the set point and sends an alarm for high temperature conditions. The X6 option combines both the X5 and X7 options. For environments which require filtration of the ambient or cabinet air, KOOLTRONIC’s Filtered KoolTray II filters the air from the bottom side of the tray. Other filter location options are available. Filtered versions are available on both the Standard and Smart KoolTray II. The X5 option provides both a visual and external alarm for fan failure or low fan speed. The visual alarm is provided by L.E.D.s corresponding to individual fans. The external alarm is provided by relay contact connection on the rear mounted terminal block for a remote warning device. For X7 option provides variable speed fan control based on temperature. High temperature alarm relay contacts are provided by way of a rear mounted terminal block for a remote warning device. The X6 option incorporates both the X5 and X7 options.